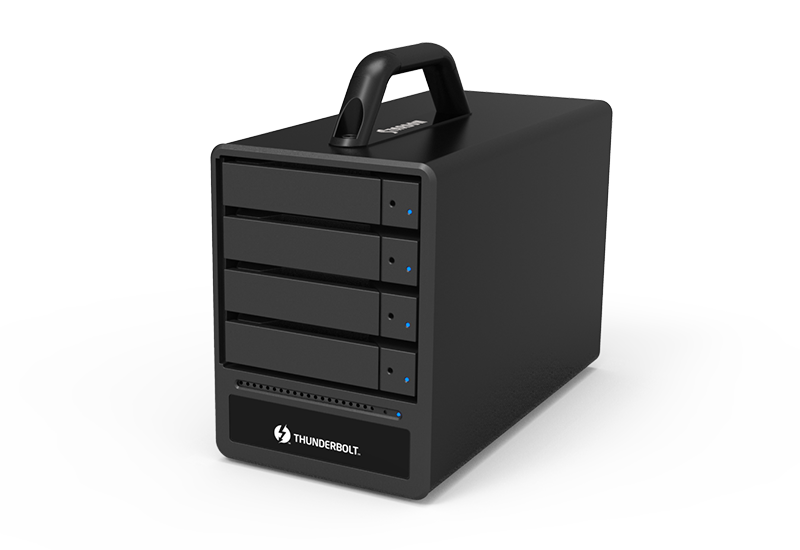 1) Hardware RAID that works seamlessly between Macs and PCs. 2) The ST4-TB3 is equipped with four configuration modes to suit every need. 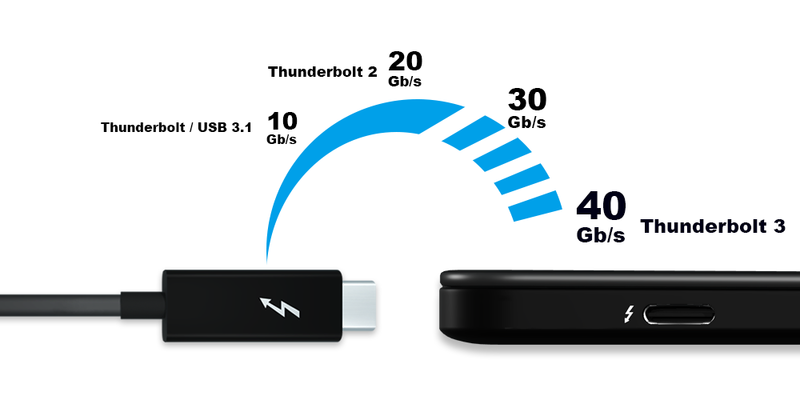 3) Thunderbolt™ 3 (USB-C) brings you 40Gbps extreme high data transfer speed. 4) ST4-TB3 to support both of 3.5" HDD and 2.5" HDD & SSD products. 5) Thunderbolt™ 3 The USB-C that does it all. ● Support 15W ( 5V/3A ) Power Delivery. ● Mini DisplayPort connect DVI、HDMI、VGA display devices. A software RAID storage system is unable to overcome the problems associated with cross-platform usage. It is only through hardware RAID controller chipsets that users can use these hard drives concurrently in Mac or Windows computers. 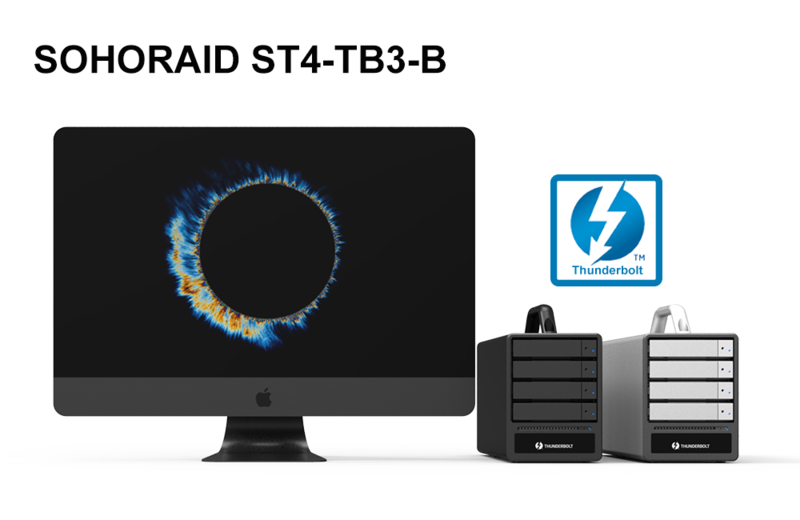 With the ST4-TB3's built-in hardware RAID controller chipset and Thunderbolt™ 3 host interface, not only does it promise high transmission speed, it also eliminates the cross-platform usage issues associated with JBOD or RAID 0/1 setups. Also, with hardware RAID, all data is computed and processed by the built-in CPU. With such advantages, your computer performance can be focused on running the software and work, instead of handling the storage device's transmission issues. (RAID storage is used between Mac OS and Windows PC platforms and needs to use the same file format, for example: exFat file format). The ST4-TB3 has four built-in disk configuration modes: RAID 1 (Safe Mode), RAID 0 (Speed Mode), RAID 10，JBOD (Two Independent Volumes) for you to choose according to your needs. 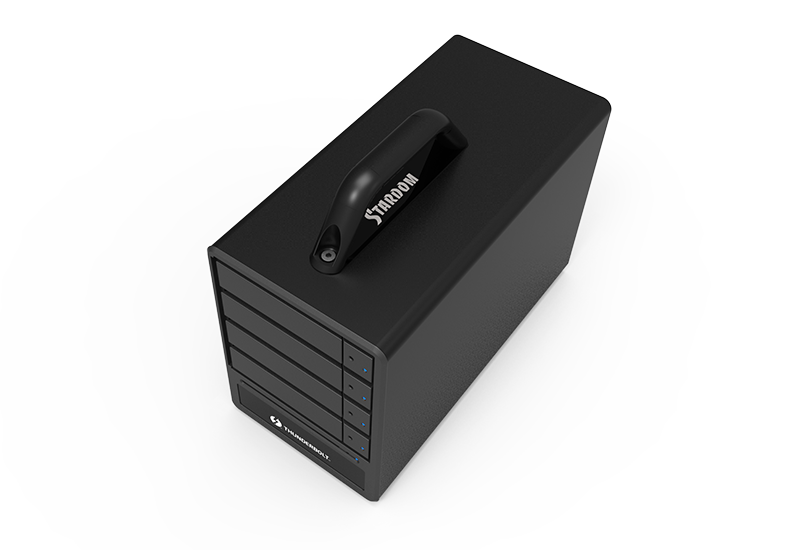 The RAID 1 function provides fully automatic backup that ensures data security. RAID 0 functionality increases storage speed and performance. RAID 10 is a RAID configuration that combines disk mirroring and disk striping to protect data. JBOD function provides two independent disk data access convenience. 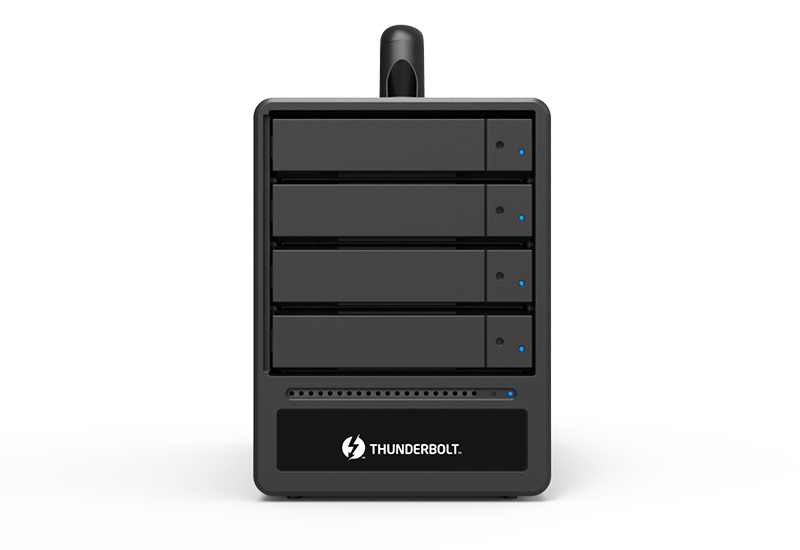 ST4-TB3 supports Thunderbolt™ 3.0 (TB3) interface for an extreme high data transfer speed. And both of the two TB3 ports are equipped with a up to 40Gb/s data transfer rate which is 4 times faster than USB 3.1 Gen 2 ,2 times faster than Thunderbolt™ 2.0 and even 8 times than SATA III interface. You could definitely use it to play your 4K high-resolution films with no any lagging hassle. 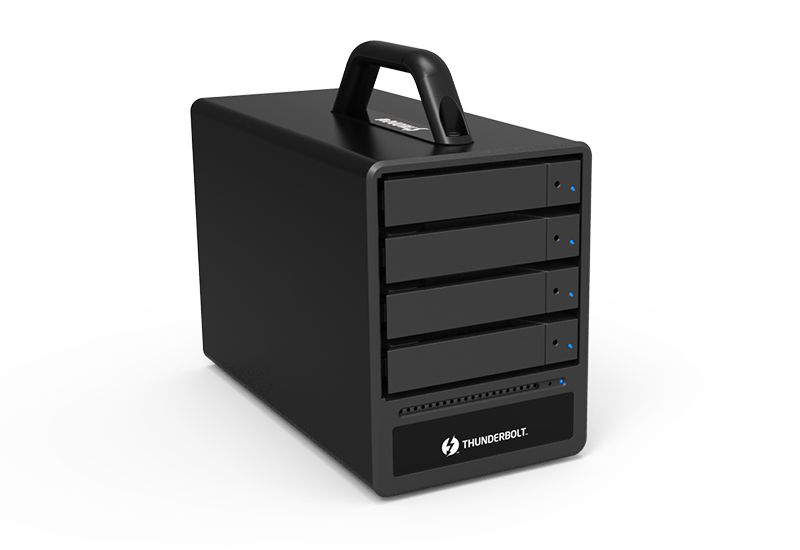 Thunderbolt™ 3.0 interface not only brings you this high data transfer rate advantage, it also let you chain maximum up to 6 products (or other compatible storage products). 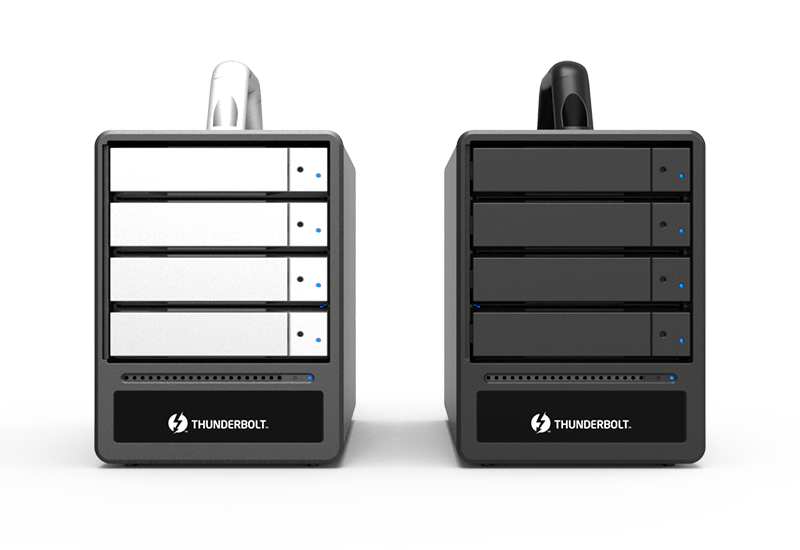 All Thunderbolt™ 3 products should be connected to the Thunderbolt™ 3 PC/Mac host. It cannot be connected to the host only with USB-C interface. Please refer to the following explanation. ST4-TB3's solid chassis is made by a thickness aluminum-alloy plate. 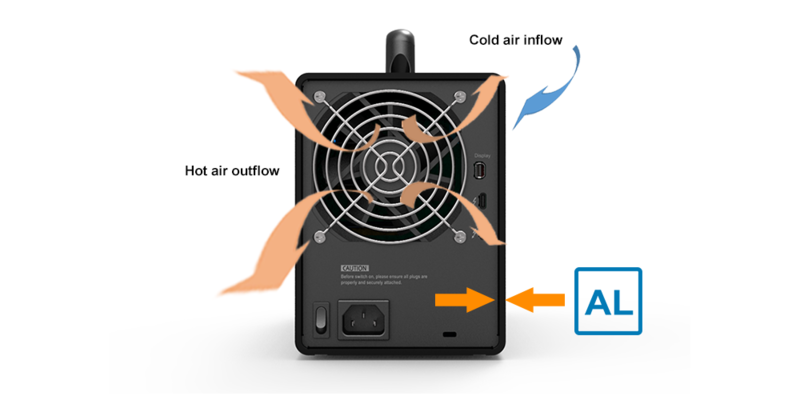 And its aluminum housing and the 9 cm FANs (with safe FAN GUARDs) really help an efficient heat dissipation for your long time use. 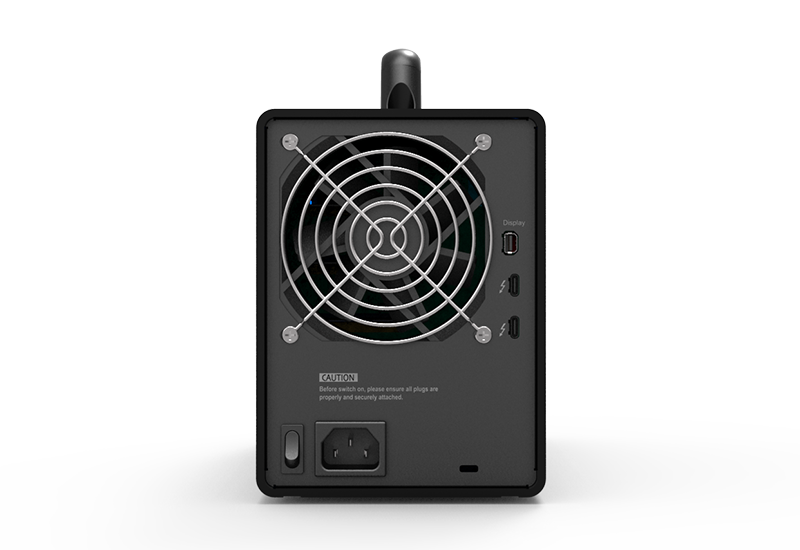 ST4-TB3 uses energy-efficient hardware components that work hand in hand with the Mac system to conserve power. It spins down hard drives and activates sleep mode after a period of inactivity. 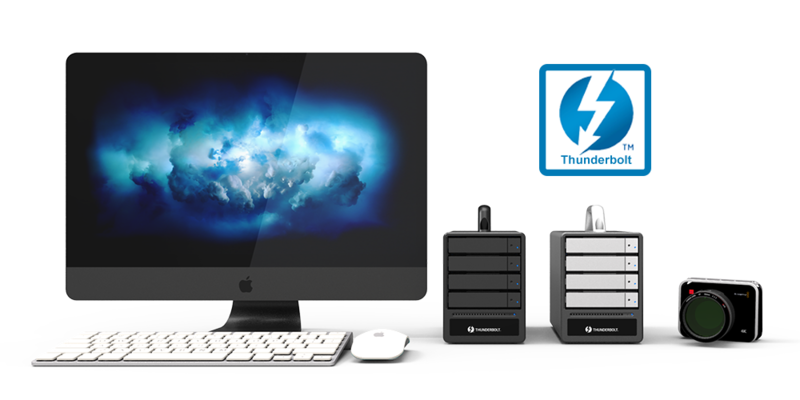 All our Thunderbolt™ 3 products support USB-C type connector and you could always use it to charge not only your mobile phone but notebook thru its 15W 5V/3A PD (Power Delivering) feature. 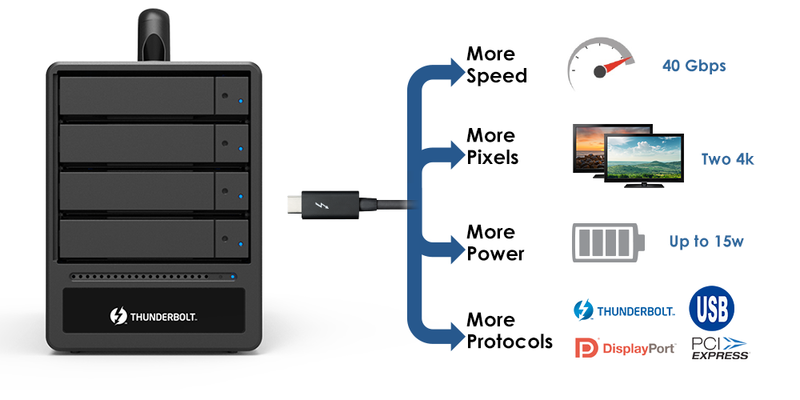 All our Thunderbolt™ 3 products also support a Mini DisplayPort which gives you a very easy way to connect to your display device. This Mini DisplayPort is fully complaint to all the existing DVI, HDMI, and VGA display devices thru an adapter. 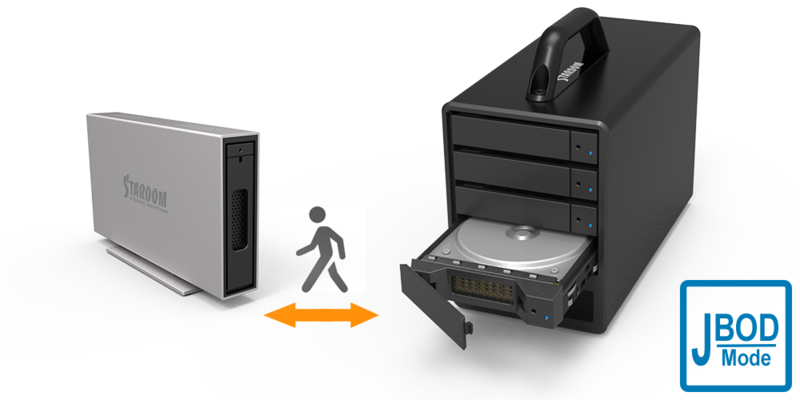 To bundle with four new easy-to-use Trays, ST4-TB3 supports any kinds of 3.5" & 2.5" HDDs/SSDs. And also, ST4-TB3's aluminum housing help protecting your data from its solid structure design and the excellent heat dissipation. Since this new easy-to-use Tray is dimensional compliant to all our Stardom products, you could easily transfer your data among different storage devices. And also, its key lock design could provide a double protection at your data from any improper Tray extracting. The ST4-TB3 has a sleek exterior design that’ll never go out of style when placed next to your Mac. It’s also built tough with thickness aluminum to shield the enclosed drives durably and to dissipate the heat created by the drives faster for the drives to work comfortably. 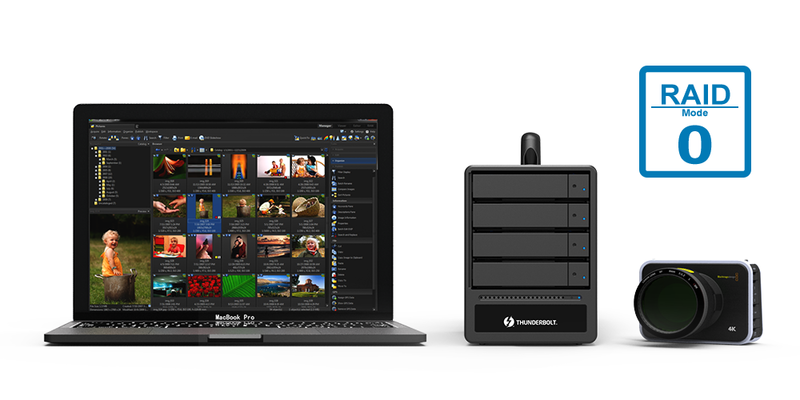 With two ultrafast Thunderbolt™ 3 ports, you can build a photo studio around Macbook Pro and ST4-TB3. Or take them with you and import thousands of RAW images on location. Once your photos are on your computer, editing in Aperture is faster and more responsive than before. ST4-TB3's RAID 0 mode lets you quickly browse large image libraries from external storage. So you have instant access to any photo in your library. Again, you could use its single-bay JBOD with either 3.5" or 2.5" HDDs/SSDs which gives you an 100% hot-swappable feature. And you could easily use and replace it with any large capacity of HDD you could buy from market. 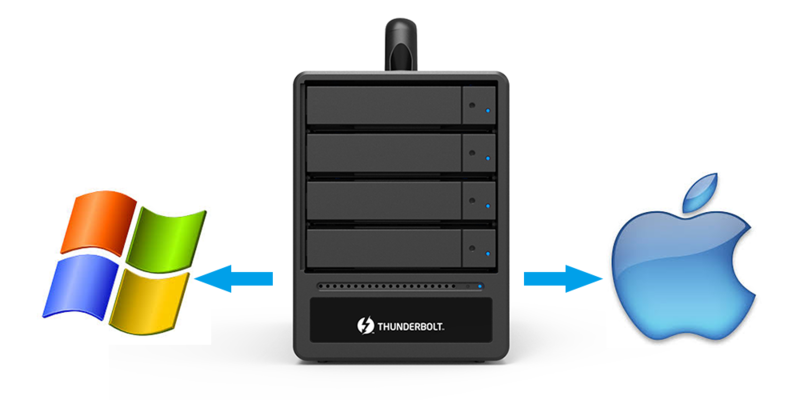 Thunderbolt™ 3 Port x 2( up to 40 Gbps ), Support 15W (5V/3A) Power Delivery. Q1What is the difference between ST4-TB3 and SR4-TB3 products? The main difference between these 2 products is the RAID modes. 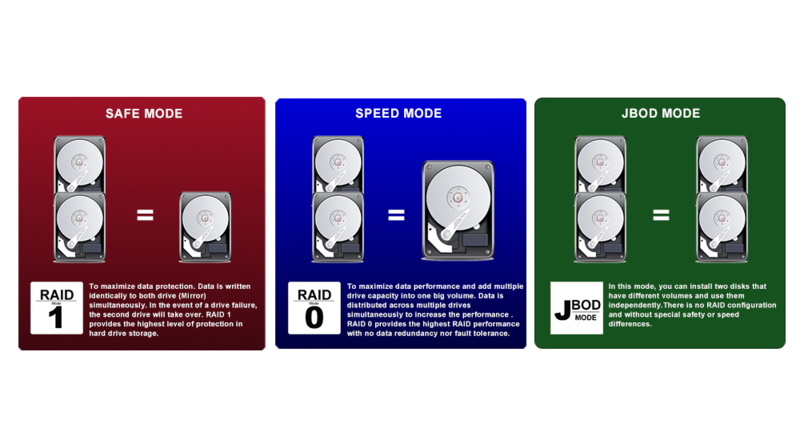 **SR4-TB3 supports RAID 0, 1, 5, 10 and JBOD modes. 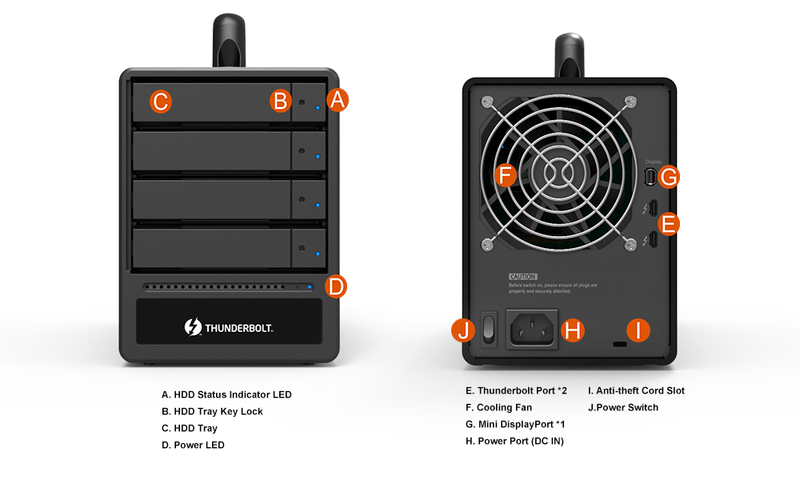 **ST4-TB3 supports RAID 0, 1, 10 and JBOD modes. Please choose the product according to your actual requirement.